Ranked #2 Wine Train Tour in the World! Starting at only $98 per person! Travel with the comfort and convenience of rail while enjoying breathtaking coastal scenery and tastes at urban wineries and restaurants. This awesome train tour is suited for wine aficionados and dabblers alike, and is ideal for couples, singles, groups... everyone! Come See Why Our Winery Train Tour is Ranked #2 In the World! VIP wine tastings at urban wineries. About 15 tastes of local wines. Optional brewery stop – choose beer instead of wine for up to half of your tastings! A behind-the-scenes view of the wine making process and a wine tasting appreciation presentation. Light Italian luncheon with fine wine pairings. See the gorgeous California coast from your comfortable seat on the train. Easy to get to/from WITHOUT DRIVING from most San Diego locations using public transportation (trolley, train, bus). *** For local train and trolley schedules, like us on Facebook. The schedules are pinned to our page for your convenience! Don’t miss out on this unique way to taste amazing local wines and see the sights of San Diego. Want door-to door transportation? You got it! Join us on our Premiere Chauffeured Tour to San Diego’s Wine Country! Click here for more details. Chevron down What Is the Difference Between the Chauffeured Winery Tour and the Winery Train Tour? Watch this video of Shira Bliss, founder and owner, describe the difference between the Chauffeured Winery Tour and the Winery Train Tour, or read the transcript below. Chevron down Are there options for Non-Drinkers on the San Diego Winery Train Tour? You can choose non-alcoholic drinks instead of the wine/beer. You will get to participate in all the wonderful food, gifts, presentations, and guided tours. Published tour ticket prices apply. Chevron down What Is Not Included in the San Diego Winery Train Tour? Gratuities for your tour guide, although not required, are always appreciated. Industry standard is 20% of your tour ticket price. ** This train tour includes a total of about 1 to 1.5 miles of guided, historic walks, with each walk being about 15 minutes at a time (.5 miles or less at a time). ***Just go to your nearest train station, e.g. Downtown San Diego station, OR Old Town Transit Center, OR Carlsbad Village Station. We run multiple routes daily, with start times varying between 11:45 am, 12:00 pm and 1:50 pm. Tour start times and locations vary. Your tour time, and convenient location to pick up the train, will be stated in the confirmation email sent to you after you book. Tour length is approximately 5 hours. Sun and Sip through San Diego’s vineyards! Features an array of wine tastings and delicious food on this all-inclusive San Diego winery tour. Great for couples, singles, and groups! Ranked #2 Winery Train Tour IN THE WORLD! 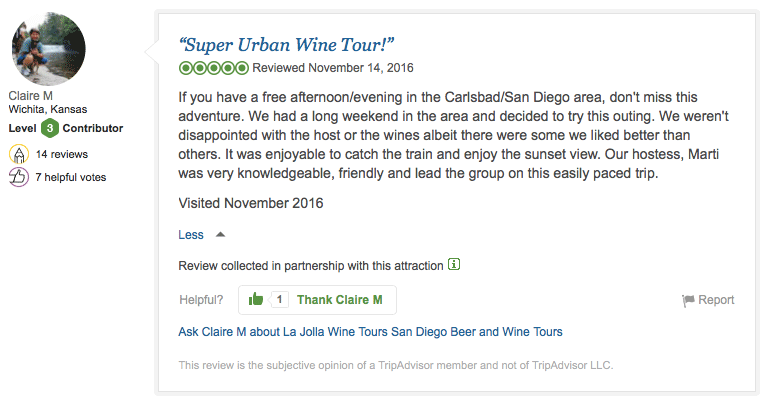 Experience the beauty of San Diego by train, while enjoying the best wine that the area has to offer, on this fabulous train tour! Enjoy beer, beer, and more beer on this tour. Explore San Diego by trolley and the best breweries in town on our "Go Green" tour!